We'll meet at Playter Gardens at 5:30PM, then ride at 5:45PM as a group to Parma Park. Join Cycle Toronto on July 26 for a TMBF Sunset Series ride from Dufferin Grove Park to Bell Manor Park! 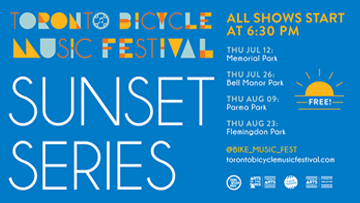 Cycle Toronto will be leading group rides across the city to each of the TBMF Sunset Series events on four Thursday evenings in July and August! We will meet at 5:30 PM and head out at 5:45 PM for the concert of the day which starts at 6:30 PM. Bring a picnic dinner along with you while you enjoy the show! Return trip provided at 8:00 PM.